“ZIPANG” started 2015 to offer the chance to experience Japanese underground party culture which recently draw a great deal of attention from all over the world. We’ll bring Japanese DJs/ artists/ creators who we want to announce to the world with pride and create an early summer magical art land at the Flower park in Shirahama of Minami-Boso. You might enjoy the gorgeous location with the panoramic ocean view of the Pacific ocean, and lightning and art decoration all over the venue, handiness of all roofed floors, variation of the shops at the market area. 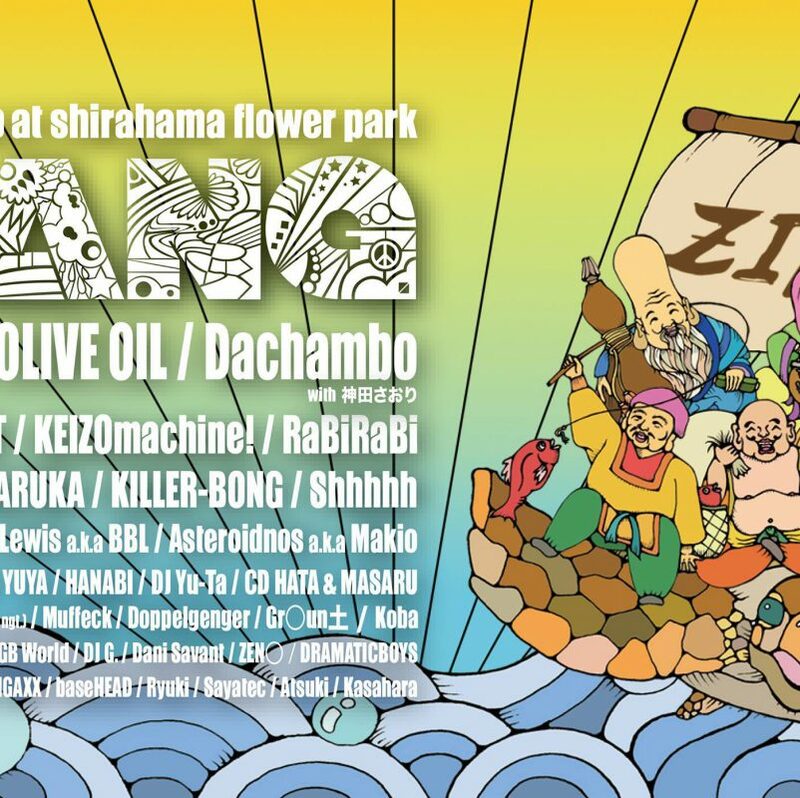 To start the great summer, there’s no way to miss the art & music festival “ZIPANG”!! ZIPANG FLOOR is a wooden deck floor by the poolside where you can have a panoramic view of Pacific Ocean. The crowd went crazy with the Hip&Hop performance by RINO LATINAⅡ& DJ YAS at ZIPANG2016. This year Hip&Hop act is; RITTO and OliveOil who are about to release a joint album under the name of “RITTO×OLIVE OIL” on 26th of July, also they played at the event called “Black Point” at CONTACT TOKYO which organized by ZIPANG crew last year. Besides the collaboration live of RITTO from Okinawa who keep releasing ‘REBEL MUSIC’ of next generation, and OliveOil, a track-maker based in Fukuoka, KEIZOmachine! from HIFANA, and Kyo Sakurai will perform a unique styled live. who are active not only in Japan but outside of Japan. ZIPANG resident DJs this year are Yu-Ta & baseHEAD, and recommend DJs of ZIPANG eRee, ME:CA, IGAXX are going to DJ at ZIPANG floor. “JUNGLE FLOOR” is hidden floor in the jungle like dense trees of the huge domed greenhouse. You’ll find the floor when you walk into deep down the trees guided by the twinkling lights. At this unique floor, the guy with the blackest sound KILLER-BONG, SEI, CMT, Naoki Kihira, ALTZ will play the freestyle DJ set. Also experimental set by akg.MangKeng (akg+ + ngt. ), Koba, medical, and up and coming DJs Gr○und & Doppelgenger will play to bring you more down to the maze of jungle. The club like floor thoughtout the event is “UPPER FLOOR”. Artists like Asteroidnos a.k.a Makio, DAIJIRO, CHOKO, DJ G. Who has been attending this event 3years in a row will be the main act of this floor. Also top DJs of Techno/ Tech house scene such as CD HATA & MASARU, BLACKSHIP, Hidefumi Watanabe, Dani Savant who recently got Japanese nationality will play too. For this year Trance scene DJs HATTA, HANABI, YUYA will join the lineup of the UPPER FLOOR to bring more hype to the floor. The space in front of“JUNGLE FLOOR” where you can chill end enjoy art at the same time. The space is directed by 〼meL-hen (RUSOW+ayanicoco) the art producer of this festival. STONE63, Taiki Kusakabe, Shogo Iwakiri, AKIRA(FLYOVER)those up and coming artists will create one piece of work. Also at the lounge they sell the artist goods, and there will be the herbal liqueur (Yakushu) bar GATOSANO so you can enjoy art with the original herbal cocktails. It takes minimum 90 minutes to the venue from the center of Tokyo. From Tokyo, through Aqualine to Tomiura interchange of Tatyama road, then to R127 and R410. If you are to use the car park you need a parking ticket for each cars, so make sure to get parking tickets beforehand. •From Narita airport, take JR Narita line heading to Chiba/Tokyo and get off first at Chiba. Then take JR Uchiboso line goes to Kisarazu/ Tateyama and off at Tateyama station to change to public bus. •From Haneda airport, take a bus of Keihin Kyuko at the bus stop No.12 goes to “Kimizu bus terminal and Tateyama station” at the outside of airport terminal 1&2 arrival lobby. Then from Tateyama station take the public bus to the venue. For more information, please contact to Keihin Kyuko bus company. For the visitors with car, we give you a parking permit at the entrance, so after getting the permit, please park the car to the parking outside of the venue. From the outside venue parking, there are 2 or 3 shuttle buses per an hour goes to the venue. The bus runs 24th of June 2:00 pm to 25th of June 5:30 pm. The official bus tour to enjoy more of ZIPANG. From Shibuya to the venue Diezone Radio will navigate you with a lot of fun. You have a free shot of herb liquor “Cocalero” inside the bus. We strongly recommend the tour to fully enjoy the festival!